NEW from the innovative minds of EuroCave comes the Pure Line of Wine Cellars. EuroCave Pure re-creates the natural deep French wine cellar climate ensuring consistent optimum storage temperature and relative humidity levels. 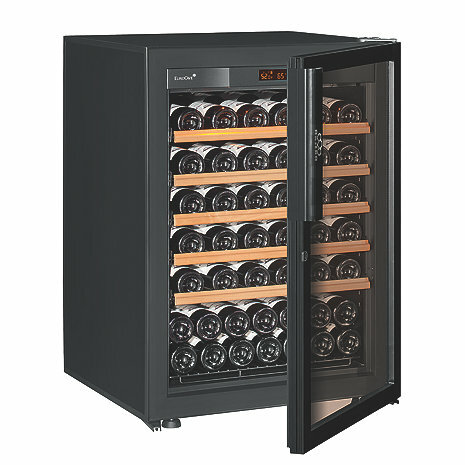 It also boasts an energy efficiency rating of A+ making it a very "green" wine storage option. The hygrometer provides an LCD display to advise of humidity range while the built-in alarm alerts when the humidity level falls too low. With its soft LED display lighting and full glass door features, the Pure offers beauty and elegance while keeping your most prized wines safe. Mon, Jun 17 - Fri, Jun 28. I cannot remove the charcoal filter, must I go absolutely to the rear of the fridge? BEST ANSWER: If it does not come out easily you may need to use a tool to help lift it out . They are only removable from the inside rear wall. Can other items be stored on top of this unit? What is the weight limit that can be placed on top of this unit? Or, can this unit be placed on top of a sturdy piece of furniture? It is not recommend to either stack on or put this unit on top of another.It is a free standing cabinet only. How many bottles does it hold ? BEST ANSWER: 60 bottles of wine in the pull out shelves, plus room for 6 magnum bottles on the bottom. Could even get a few small bottles on top of the magnums. The answer will vary if you include champagne. I currently holding 70 bottles. Ten champagne bottles on the top tray, 12 wine bottles in each of the next four trays, and 12 more bottles stacked on 2 rows on the bottom shelf. If you have half-bottles, you could store a couple more in bottom shelf. Depending on the bottle shape and size, 45-65. Can this be built into a cabinet? BEST ANSWER: I would say "yes", although it should be someone with expertise in custom cabinetmaking. The way the door opens may create some issues. You can build with proper venting of cabinet and no frontal closure. Best to call in Wine Enthusiast 800 356 8466 for details. I don't think so. The refrigerant components are all in the back so it would not be able to ventilate well. BEST ANSWER: Eurocave Wine Cellars are hand made in France. Eurocave's are made in France. What are the external dimensions of this Unit? It does require a 3 " clearance of air on the backside , 4" minimum at the top and 1" on each side. BEST ANSWER: Eurocaves will cost you at least half if not more of what a lesser brand would cost as far as electrical costs go. Lighting Question: I recently purchased a Eurocave Pure S cooler. Everything works very well save for the light on the temperature/humidity gauge. The light, while not quite flickering give the appearance that the temperature and humidity numbers are pulsating. Has anyone else noticed this? And do you have a potential solution? Thank you! Best free standing wine refrig! I have purchase 3 eurocaves. Best free standing wine refrigerator on the market. Almost as good as my wine cellar! I'm glad I upgraded to Pure S model. Very quiet and looks so elegant. This is my second Eurocave of this size. First one is approximately 9 years old and still running without any problems. I did notice that with age the LED panel gets dimmer and the cellar seems to become less efficient (motor seems to turn on more frequently). I've owned a number of different high-end cellars, large and small, to date and this seems to be the norm with age. IMO Eurocave seems to be a good pick among the high-end cellars, particularly in this size. I have been researching for quite a while and finally decided on the eurocave. It is beautiful to look at and I love the interior lighting. The temperature remains pretty stable and I am using it for reds, whites and champagnes. Like the bran. I have one for more then 10yerars, working great. Got this model just for a smaller room . I don't like a shipping company WE using for a delivery. I took me 1,5 week to get it to my home from there storage (free shipping! ), I've had it delivered after a several call and a supervisor assistant. Wish WE use UPS or FEDEX. High quality unit. I'm pleased so far but I had a little trouble getting the humidity level up to the suggested level. The folks in tech support have been helpful though. I haven’t received it and it should have been here 2 weeks ago.